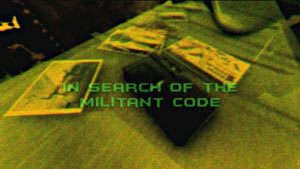 Platsen där IN SEARCH OF THE MILITANT CODE utspelar sig är en 3D animerad stad, ABADYL, en digital värld konstruerad av konstnären Michael Johansson. Abadyl är ett pågående konstprojekt där han bjuder in andra konstnärer, arkitekter, speldesigners och kreatörer att fylla delar av sin skapade värld med innehåll eller använda den för att iscensätta berättelser. Som detta filmiska projekt som utvecklats till en självständig produktion. Det stora konstprojektet presenteras närmre på Michael Johanssons blog och webbsida http://abadyl.com Här följer en introduktion till hur ABADYL är konstruerad. In Abadyl the overall idea is to explore a complex digital space in a setting that invites to participation. Abadyl has over the years developed to a detailed and complex, yet open setting that can be utilized in order to generate scenarios for the temporary co-creators of Abadyl, who would then interact in an optional environment, in the end producing new artefacts. In Abadyl the intention is not to establish a so called great narrative, but inspiration has been retrieved from the art of novel writing and its practice in constructing worlds. In “Postscript to the Name of the Rose”, Umberto Eco writes on the generative logic he has adopted, a logic both limiting and expanding creativity. The fundamental parameters guide what can and what cannot be included in a fictional but historically plausible universe. In The City of Abadyl we have chosen to focus more on the generative itself in this logic; that is to say, it is not about parameters resulting in a watertight consistent universe, but the main interest is in what can be generated from a large number of predetermined parameters. 16. The locations constituting the starting point are sixteen in number, and were initially held apart. But as the reference bulk was collected and travels increased, the idea emerged of uniting these enclaves into a connected city. 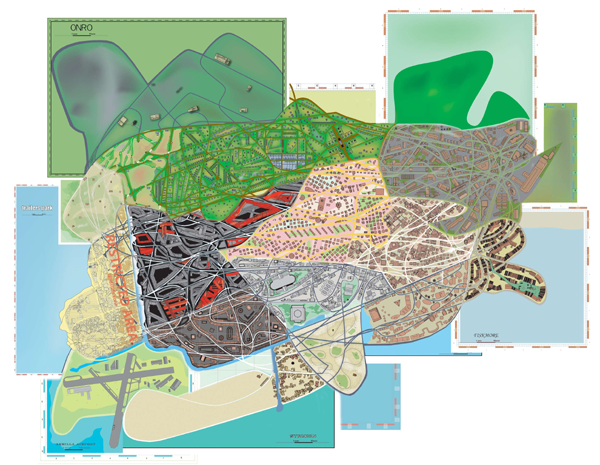 As joining infrastructure a series of sixteen Formula One- tracks was chosen, piled on top of each other to a joint figure. Hence aiming to expose architecture and cityscape to extreme strain (= life, unpredictability). 100. In the various quarters of the city 100 objects would be found, each devised in a way that constituted an elegant description and was manifesting the aspects of their very own district. In this way we happened to examine our original objects once again, when we were depicting them in every detail. To be very thorough in investigating its form, visualises other layers in the object and creates conditions for both deconstruction and new narratives. To force out its meaning by depicting/modelling – to sort of philosophize from the street up. In each quarter focus is set on a certain individual, a destiny. Each of these characters is equipped with a keyword list, features which she/he will be exposed to and relate to. Neebi was built from the start in order to offer more people a possibility to live in the town. The characteristic architecture styles is the 50`s. The inhabitants in Neebi is not directly religious nowadays, despite that the in Neebi exists a big church. In Neebi there are several alternative businesses. One also knows that Neebi is the basis for feminist graffiti groups, although they are rarely spotted. The is extremely dexterous on holding themselves hidden and anonymous. For an outsider is the difficult to hold something classified for a people here. Many in Neebi, above all hackers, have a poor, or rather almost none costing attitude. This has meant that they are extreme thin.